The construction and restoration of the Museum of Troy and the Hamidiye Bastions, which started in 2014, are to open in 2017. Justice and Development Party (AK Party) Group Deputy Chairman Bülent Turan spoke to the press and said the construction and restoration of the museum and the bastions cost a total of TL 50 million ($14 million) and Çanakkale will gain important cultural assets once they are finished. 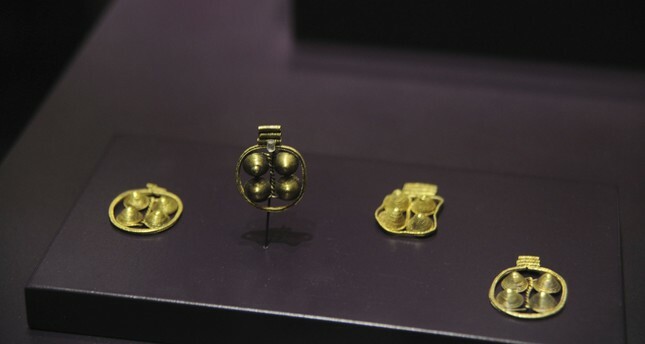 Turan said the museum will display artifacts unearthed in the ancient city of Troy, which has a 5,000-year-old history. Explaining that Çanakkale is a cultural hub with ancient cities such as Assos, which is home to ruins of the Temple of Athena and Troy, Turan said the new museum would add brand value to the city. "Troy was included in UNESCO's World Heritage List in 1998. It is a historic place that is known by many people around the world. Troy has witnessed thousands of years of Çanakkale's history. Although we previously had some infrastructural problems, we have managed to solve a great deal of them, and now we will have a museum that will set an example for other ancient sites in the world." The Museum of Troy is being made to look like an old building; however, the interior of the museum will be one of the few modern museums in Turkey. The museum cost nearly TL 50 million. The facility will have 10,000-square-meters of indoor exhibition area, including exhibition halls of more than 3,000- square-meters. Troy is one of the most famous world archaeological sites thanks to Homer's well-known Greek epic "The Iliad," which recounts the Trojan War. The first excavations at the site were undertaken by the famous archaeologist Heinrich Schliemann in 1870. The Troy archaeological site is of immense significance for understanding the development of the European civilization at a critical stage in its early development. It documents an uninterrupted settlement sequence of more than 3,000 years and bears witness to the succession of civilizations. The role of Troy is of particular importance in documenting relations between Anatolia, the Aegean and the Balkans given its location at a point where the three cultures met. Apart from the museum, which will showcase the discoveries that have been found at the archaeological site since the late 19th century, the Hamidiye Bastions will reopen for tourists later this year. Built by Marshall Asaf Pasha in 1892 by the order of Ottoman Sultan Abdülhamid II, the Hamidiye Bastions are located along the Dardanelles and have been used for different purposes over the years. Turan said the bastions were idle for many years; however, they have been undergoing a major restoration thanks to the initiatives of the Culture and Tourism Ministry. "The restoration work, which covers over 105 decares, continues at full speed. The 10 bastions were originally built for the defense of the Dardanelles. The restoration, which was launched in 2013, has nearly come to an end. This place will not only serve as a cultural center but also become a center for congresses, entertainment and a place where people will make good memories. The Hamidiye Bastions will be a hub for all exhibitions, wedding ceremonies and meetings in the province of Çanakkale." All the Ottoman sultans that followed Mehmed II were aware of the importance of the Dardanelles for the defense of the capital city of Istanbul. After the bastions were restored and new bastions were added by Ottoman Sultan Abdülhamid II, the Dardanelles became "impassable" for enemies, and the bastions played an important role during the Battle of Gallipoli in 1915 in World War I. During the Battle of Gallipoli, one of the greatest battles that the Turks fought in their search for independence, Sultan Abdülhamid was rumored to have said: "If the castles and bastions that my ancestors and I built are still standing, there is no way that the enemy can pass though the Dardanelles." These historically important and newly restored Hamidiye Bastions will portray World War I and the Battle of Gallipoli chronologically. Moreover, the economic and social effects of the war and their reflections on the present day will be exhibited for viewers via exhibitions, animation, interactive techniques and graphics. The audience will be able to experience the war while learning history and questioning it.